On Sept. 5, 1995, sniper Kenneth Dean of the Ontario Provincial Police shot and killed Anthony O-Brien “Dudley” George during a police raid to remove native protesters from the Ipperwash Provincial Park in Ontario, Canada. The protesters wanted Camp Ipperwash, formerly known as Stony Point reserve, to be returned to the native people, the land’s descendants. The land has been taken over by the government since 1942 and converted into Camp Ipperwash, a military training camp. Stony Point descendants had been protesting since 1993 but negotiations have stalled time and time again. This time, they decided to force the issue by moving into the park on Sept. 4 to stage their protest. They were counting on full community support but only 30 people showed up to join the protest. During a nighttime police raid about two days later, George, one of the protesters, was shot dead. What followed was a well publicized trial. In 1996, the family of George filed a wrongful death lawsuit, naming Premier Mike Harris as one of the defendants, based on allegations that Harris initiated and ordered the raid that led to George’s death. Harris denied the allegation and never called for an inquiry during his tenure. 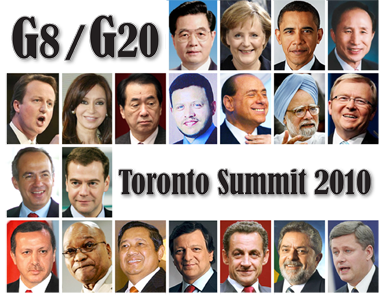 In 2003, the Ontario Liberals came to power and new premier Dalton McGuinty made good on his election promise to have an inquiry into the police action that led to George;s death. But just before the Liberals had won the election, George’s family agreed on a settlement of their civil suit against Harris and some members of his cabinet. They also accepted a $100,000 settlement from the provincial police plus undisclosed legal costs. The criminal case dragged on for several years but, when it was finally over, Ontario Judge Huge Fraser ruled that Kenneth Deane knew Dudley George was unarmed when he shot the protester. Dean was found guilty of criminal negligence causing death, and was ordered to perform 180 hours of community service. He was not required to spend time in jail or put under house arrest. An official report on the Ipperwash inquiry, released in May 2007, took the first step in addressing the First Nation grievances by initiating a discussion on the eventual transfer of the Ipperwash National Park to the Chippewas of Kettle and Stony Point First Nation. It outlined the benefits to the community and the surrounding non-abiriginal communities, improving relationaships and economic development. Dudley Geroge’s story became the subject of a 2006 movie — titled “One Dead Indian” — in which the characters were played by an ensemble of Canadian aboriginal actors. 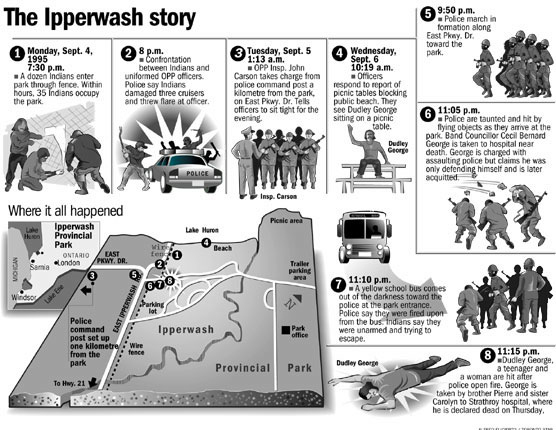 The graphic, which was done frame-by-frame, comic book-style, was put together a few days after the incident at Ipperwash. While some of the details gathered early on — which formed the basis for the graphic — had been found during the course of the trial not to be very accurate, the general drift of the story turned out to be spot on. Graphic by Alfred Elicierto, published in the Toronto Star in late 1995.